Gen Kelsang Rabten, the National Spiritual Director for Kadampa Buddhism in Australia, New Zealand, and South East Asia, has trained under the guidance of Venerable Geshe Kelsang Gyatso for more than twenty years. His deep faith in Buddha’s teachings and the sincerity of his practice inspire many people to embark on a meaningful and rich spiritual life. Gen Rabten will grant the empowerment of Manjushri, give teachings and ommentary at the New Zealand Dharma Celebration. Kelsang Pawo is the Resident Teacher of Kadampa Meditation Centre Auckland. He is a Kiwi Buddhist monk who is dedicated to helping people develop inner peace, and find real meaning in their lives. Kelsang Pawo will guide the meditation sessions during the New Zealand Dharma Celebration. 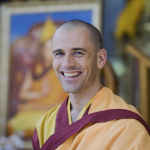 Kelsang Shechog is the Resident Teacher at Kadampa Meditation Centre Wellington. She is an Australian Buddhist nun who has been studying and practising Kadampa Buddhism with Venerable Geshe Kelsang Gyatso Rinpoche for many years. 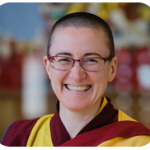 Shechog is known for her ability to inspire others through sincere practice and to present the deeper meanings of Venerable-Geshe-la’s books in a way that is practical and relevant to all who listen. 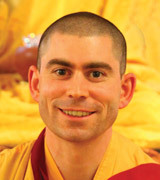 Kelsang Shechog will guide the retreat at Kadampa Meditation Centre Auckland after the New Zealand Dharma Celebration. Gen Kelsang Dornying, the Resident Teacher of both Kadampa Meditation Centre Australia and Kadampa Meditation Centre Melbourne, will be teaching at the introduction. Kelsang Ani, the Resident Teacher of Dharmapala Kadampa Meditation Centre in Perth, will guiding the morning meditations.